We live halfway between Marble Falls and Lago Vista at Turkey Bend a LCRA Recreational Park. We moved from San Marcos were we lived for 2 and a half years, dancing with Wheel-n-Deals. 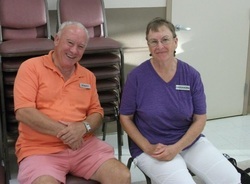 Robert started Square Dancing in Australia in 1990 and Cassandra also started Square Dancing in Australia in 1996. We've attended 3 Nationals, Orlando, Charlotte and Long Beach. We have been married for 15 years. We met on the internet and Cassandra came over to Australia and I returned with her to live in Southern California. It was here that we became Presidents of the largest Square Dance Club in Southern California, Orange Coast Lariats. Robert is a Minister of Religion, Public Speaker and Psychologist and Cassandra is a Computer Systems Engineer and Psychologist. We both have 2 children to previous marriages. Roberts children's live in England with 3 Grandchildren, and Cassandra's children live in Virginia and California, with 2 Grandchildren. Cassandra is an avid dancer and has taught Line Dancing and Round Dancing; she is also a Feldenkrais Practitioner, if you are curious at that have a look on the internet as it's different. Robert talks funny and loves people as people are what makes the world so varied and wonderful. He has lived in England, Rhodesia, South Africa, Australia, USA, Costa Rica, Panama and Cassandra has lived in USA, Hong Kong, Taiwan, France, Costa Rica and Panama. We also have a Web Design Business with clients from around the world, many we have never met, http://www.apurplekangaroo.com Robert enjoys Freemasonry and Cassandra is a Mensan. We are full time RV'ers so our home is a mobile one, we stay as long in a spot as we want and then move on to new adventures and new friends, like you.